Over its life span, the average double fluorescent light produces more greenhouse gas pollution than an automobile does in a single year. Slash this wastage with the all-new MIRRORLUX REFLECTOR! Over the last five years, CarbonetiX has helped hundreds of organisations slash their energy costs and reduce greenhouse pollution. With the revolutionary product, Mirrorlux Reflectors, double fluorescent fittings are "de-lamped" and then fitted with Mirrorlux Reflectors to maintain high illumination levels while only using one tube. The revolutionary Mirrorlux Reflector increases the amount of useful light produced and can be used to cut the energy use of the fitting in HALF. The Mirrorlux halves the energy use of the fitting by enabling one of the two tubes in the fitting to be removed. While the light output also drops by around 30%, in many cases lighting levels are still adequate and above the minimum standard. If the lighting level is too low, a brighter "quad-phosphor" fluoro tube can be installed - that uses no more power than the tube its replacing - but in most cases will bring lighting levels back to what they were previously with the two tubes. With fluorescent lighting being so prevalent, it's easy to take it for granted. Yet over its lifetime of 20 years, a typical double flouro fitting in an office will produce around 5 tonnes of greenhouse gas pollution. That's more than a car produces in one year! 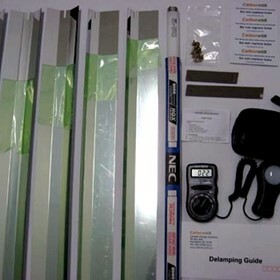 If you aren't completely satisfied with the Delamping Kit, we offer an unconditional guarantee. Simply return the lux meter, reflectors and fluoro tube to us within three months of receiving them and we will send your money back! You can keep the rest, including the delamping guide which could save you thousands by eliminating the need to have a consultant engineer assess your lighting.